The cushion-shaped diamond of light yellow color weighing approximately 37.00 carats, flanked by 10 tapered baguette diamonds weighing approximately 1.00 carat, within a raised, openwork 18 karat gold mounting. Accompanied by GIA report no. 11861041 stating that the diamond is Fancy Light Yellow, Natural Color, VS1 clarity; together with original working diagram stating that the stone may be improvable. That last sentence essentially means that the stone is very clean, and that there are flaw(s) near the outer surface of the stone that may be cut out, improving its clarity. 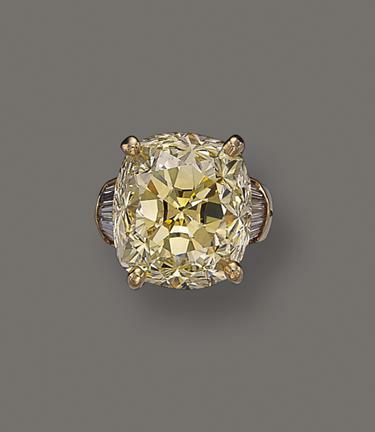 The Queen of Holland is an example of a large diamond that was recut to boost its clarity. The estimate for the ring was $175,000 to $225,000 US, and in the end, it sold for $185,500 US.